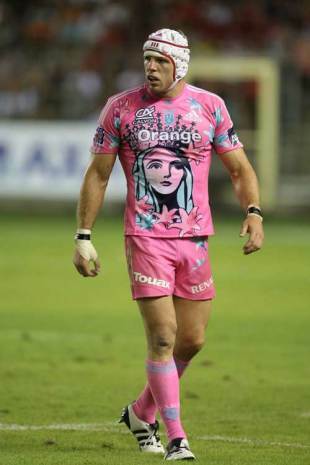 The Top 14 reaches the second round this weekend with Stade Francais and Bayonne kicking things off with the first league clash staged on foreign soil. The Estadio Anoeta in northern Spain, usually the home of football team Real Sociedad, will play host to the clash with Bayonne hoping for a capacity 35,000 crowd having switched the game from their own Stade Jean-Dauger. The stadium, situated in San Sebastien, is only 50km from Bayonne and has previously been used by fellow Top 14 side Biarritz for Heineken Cup clashes. The two Basque rivals will play each other at the stadium in round six of this season's competition. Fresh from their hard-fought 22-22 draw in Toulon last week, Stade are this week boosted by the availability of returning internationals Pascal Pape, Sylvain Marconnet, Mauro Bergamasco, Lionel Beauxis and Julien Arias. Stade coach Ewen McKenzie will also be looking for another strong showing from England international duo Tom Palmer and James Haskell who made their Top 14 debuts last time out. McKenzie is also likely to hand Mathieu Bastereaud a place in the starting line-up after the troubled centre made his playing return off the bench at the Stade Mayol. Bayonne lost last week to Perpignan in a game they should perhaps have won. A furious Bayonne coach Richard Dourthe slammed his side following the game with much of his anger aimed at scrum-half Cedric Garcia who only slotted two of his six kicks at goal. As a result, Dourthe has recalled heavyweights Remy Martin, Julien Puricelli and Craig Gower to his starting side to face the guaranteed onslaught from the Parisians. Garcia has paid the price for his kicking woes and starts on the bench, his spot is taken by Benat Arrayet. In our feature game on Saturday, Toulon are at home again as they play host to promoted side Racing Metro 92. Click here for our Game of the Week match preview. Montauban appear to have an exceptionally difficult task ahead of them when they travel to the Stade Michelin to take on perennial title challengers Clermont Auvergne. The visitors laboured to a woeful away record last season but their one victory on the road did come at Clermont. However, there doesn't seem much chance of a repeat with Clermont having opened their account with an impressive away win in Bourgoin last weekend. In addition, Clermont have two of the most dangerous men in the league in the form of points machine Brock James and wing Napolioni Nalaga. Scrum-half Morgan Parra could be handed his first start by coach Vern Cotter with Kevin Senio struggling with injury. Montauban's resources remain stretched with the Direction Nationale d'Aide de Controle et de Gestion (DNACG - the league's financial watchdog) refusing to ratify six players' contracts due to financial irregularities. The players in question are Andrew Henderson, Emmanuel Etien, Mirko Lozupone, Alejandro Campos, Joel Koffi and Maxime Le Bourhis. Toulouse escaped with a narrow 17-16 win over nearby rivals Montauban last week but it is still difficult to envision the Brive foreign legion leaving Stade Ernest Wallon with a victory when they visit on Saturday. There are still doubts over the fitness of fly-half Frederic Michalak who is suffering with a hamstring injury but experienced coach Guy Noves will surely have enough firepower to draw from in his extended squad. Brive are still without fly-half Andy Goode but in his absence Luciano Orquera orchestrated their emphatic win over Montpellier last week, ably supported by former Bristol scrum-half and England international Shaun Perry. Perpignan face the short trip up the road to Montpellier and will be confident that they can maintain their dominance over their local rivals. They come off a solid if unspectacular win over Bayonne in the opening round but under Jacques Brunel sport a tight-knit and disciplined outfit. Montpellier could well struggle this season with some evident shortcomings particularly up front. They suffered a further blow after their opening game as Eugene Van Staaden, Jerome Vallee and Olivier Sarramea all picked up injuries. Biarritz will be hoping to bounce back to form against Top 14 newcomer Albi at the Stade Aguilera having been well beaten by Castres at the same ground last week. The Basque side were without influential duo Imanol Harinordoquy and Dimitri Yachvili who remain sidelined with a tendon tear and a sprained ankle respectively while flanker Magnus Lund will be out of action for five weeks after tearing a calf muscle in their opening defeat. American wing Takudzwa Ngwenya remains unavailable due to his international commitments. Albi lost on the opening day of the season to fellow promoted side Racing Metro 92 and should Eric Bechu's side manage to win on the Western seaboard, it would rank as a massive fillip to their season. In the final game of the round Castres play host to Bourgoin on Saturday evening. Castres secured arguably the most impressive victory in the opening round and will be supremely confident of repeating that this week. Bourgoin remain in turmoil due to their financial situation and the unavailability of 14 squad members. They did well to push Clermont for a large proportion of their game last week but the odds look against them once again.